Chemical compounds in the Cannabis plant, including 400 different cannabinoids such as tetrahydrocannabinol (THC), allow its drug to have various psychological and physiological effects on the human body. Different plants of the genus Cannabis contain different and often unpredictable concentrations of THC and other cannabinoids and hundreds of other molecules that have a pharmacological effect, so that the final net effect cannot reliably be foreseen. Acute effects while under the influence can include euphoria and anxiety. Although some assert that Cannabidiol (CBD), another cannabinoid found in cannabis in varying amounts, may alleviate the adverse effects of THC that some users experience, little is known about CBD’s effects on humans. The well-controlled studies with humans have a hard time showing that CBD can be distinguished from a placebo, or that it has any systematic effect on the adverse effects of cannabis. When ingested orally, THC can produce stronger psychotropic effects than when inhaled. At doses exceeding the psychotropic threshold, users may experience adverse side effects such as anxiety and panic attacks that can result in increased heart rate and changes in blood pressure. and the ultimate conclusions on these factors are disputed. Cannabis use disorder is defined as a medical diagnosis in the fifth revision of the Diagnostic and Statistical Manual of Mental Disorders (DSM-5). The most prevalent psychoactive substances in cannabis are cannabinoids, particularly THC. Some varieties, having undergone careful selection and growing techniques, can yield as much as 34% THC. 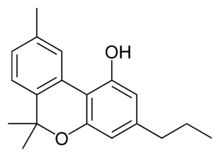 Another psychoactive cannabinoid present in Cannabis sativa is tetrahydrocannabivarin (THCV), but it is only found in small amounts and is a cannabinoid antagonist. 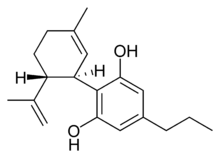 There are similar compounds in cannabis that do not exhibit psychoactive response but are obligatory for functionality: cannabidiol (CBD), an isomer of THC; cannabivarin (CBV), an analog of cannabinol (CBN) with a different side chain, cannabidivarin (CBDV), an analog of CBD with a different side chain, and cannabinolic acid. How these other compounds interact with THC is not fully understood. Some clinical studies have proposed that CBD acts as a balancing agent to regulate the strength of the psychoactive agent THC. CBD is believed to regulate the metabolism of THC by inactivating cytochrome P450, an important class of enzymes that metabolize drugs. Experiments in which babies were treated with CBD followed by THC showed that CBD was associated with a substantial increase in brain concentrations of THC and its major metabolites, most likely because it decreased the rate of clearance of THC from the body. Cannabis cofactors have also been linked to lowering body temperature, modulating immune function, and cell protection. The essential oil of cannabis contains many fragrant terpenoids which may synergize with the cannabinoids to produce their unique effects. THC is converted rapidly to 11-hydroxy-THC, which is also pharmacologically active, so the euphoria outlasts measurable THC levels in blood. THC and cannabidiol are neuroprotective antioxidants. Research on rats has demonstrated that THC prevents hydroperoxide-induced oxidative damage as well as or better than other antioxidants in a chemical (Fenton reaction) system and neuronal cultures. Cannabidiol was significantly more protective than either vitamin E or vitamin C.
The cannabinoid receptor is a typical G protein-coupled receptor. A characteristic of this type of receptor is the distinct pattern of how the molecule spans the cell membrane seven times. Cannabinoid receptors are located on the cell membrane, and both outside (extracellularly) and inside (intracellularly) the cell membrane. CB1 receptors, the bigger of the two, are extraordinarily abundant in the brain: 10 times more plentiful than the μ-opioid receptors responsible for the effects of morphine. CB2 receptors are structurally different (the sequence similarity between the two subtypes of receptors is 44%), found only on cells of the immune system, and seems to function similarly to its CB1 counterpart. CB2 receptors are most prevalent on B-cells, natural killer cells, and monocytes, but can also be found on polymorphonuclear neutrophil cells, T8 cells, and T4 cells. In the tonsils the CB2 receptors appear to be restricted to B-lymphocyte-enriched areas. THC and its endogenous equivalent anandamide additionally interact with glycine receptors. Cannabinoids usually contain a 1,1′-di-methyl-pyran ring, a variedly derivatized aromatic ring and a variedly unsaturated cyclohexyl ring and their immediate chemical precursors, constituting a family of about 60 bi-cyclic and tri-cyclic compounds. Like most other neurological processes, the effects of cannabis on the brain follow the standard protocol of signal transduction, the electrochemical system of sending signals through neurons for a biological response. It is now understood that cannabinoid receptors appear in similar forms in most vertebrates and invertebrates and have a long evolutionary history of 500 million years. The binding of cannabinoids to cannabinoid receptors decrease adenylyl cyclase activity, inhibit calcium N channels, and disinhibit K+A channels. There are at least two types of cannabinoid receptors (CB1 and CB2). The CB1 receptor is found primarily in the brain and mediates the psychological effects of THC. The CB2 receptor is most abundantly found on cells of the immune system. Cannabinoids act as immunomodulators at CB2 receptors, meaning they increase some immune responses and decrease others. For example, nonpsychotropic cannabinoids can be used as a very effective anti-inflammatory. The affinity of cannabinoids to bind to either receptor is about the same, with only a slight increase observed with the plant-derived compound CBD binding to CB2 receptors more frequently. Cannabinoids likely have a role in the brain’s control of movement and memory, as well as natural pain modulation. It is clear that cannabinoids can affect pain transmission and, specifically, that cannabinoids interact with the brain’s endogenous opioid system and may affect dopamine transmission. Most cannabinoids are lipophilic (fat soluble) compounds that are easily stored in fat, thus yielding a long elimination half-life relative to other recreational drugs. The THC molecule, and related compounds, are usually detectable in drug tests from 3 days up to 10 days according to Redwood Laboratories; long-term users can produce positive tests for two to three months after ceasing cannabis use (see drug test). No fatal overdoses with cannabis use have been reported. A review published in the British Journal of Psychiatry in February 2008 said that “no deaths directly due to acute cannabis use have ever been reported”. THC, the principal psychoactive constituent of the cannabis plant, has an extremely low toxicity and the amount that can enter the body through the consumption of cannabis plants poses no threat of death. In dogs, the minimum lethal dose of THC is over 3 g/kg. According to the Merck Index, the LD50 of THC (the dose which causes the death of 50% of individuals) is 1270 mg/kg for male rats and 730 mg/kg for female rats from oral consumption in sesame oil, and 42 mg/kg for rats from inhalation. It is important though to note that cannabinoids and other molecules present in cannabis can alter the metabolism of other drugs, especially due to competition for clearing metabolic pathways such as cytochromes CYP450, thus leading to drug toxicities by medications that the person consuming cannabis may be taking. A 2007 study found that while tobacco and cannabis smoke are quite similar, cannabis smoke contained higher amounts of ammonia, hydrogen cyanide, and nitrogen oxides, but lower levels of carcinogenic polycyclic aromatic hydrocarbons (PAHs). This study found that directly inhaled cannabis smoke contained as much as 20 times as much ammonia and 5 times as much hydrogen cyanide as tobacco smoke and compared the properties of both mainstream and sidestream (smoke emitted from a smouldering ‘joint’ or ‘cone’) smoke. Mainstream cannabis smoke was found to contain higher concentrations of selected polycyclic aromatic hydrocarbons (PAHs) than sidestream tobacco smoke. However, other studies have found much lower disparities in ammonia and hydrogen cyanide between cannabis and tobacco, and that some other constituents (such as polonium-210, lead, arsenic, nicotine, and tobacco-specific nitrosamines) are either lower or non-existent in cannabis smoke. Cannabis smoke contains thousands of organic and inorganic chemical compounds. This tar is chemically similar to that found in tobacco smoke or cigars. Over fifty known carcinogens have been identified in cannabis smoke. These include nitrosamines, reactive aldehydes, and polycylic hydrocarbons, including benz[a]pyrene. Marijuana smoke was listed as a cancer agent in California in 2009. A study by the British Lung Foundation published in 2012 identifies cannabis smoke as a carcinogen and also finds awareness of the danger is low compared with the high awareness of the dangers of smoking tobacco particularly among younger users. Other observations include possible increased risk from each cigarette; lack of research on the effect of cannabis smoke alone; low rate of addiction compared to tobacco; and episodic nature of cannabis use compared to steady frequent smoking of tobacco. Professor David Nutt, a UK drug expert, points out that the study cited by the British Lung Foundation has been accused of both “false reasoning” and “incorrect methodology”. Further, he notes that other studies have failed to connect cannabis with lung cancer, and accuses the BLF of “scaremongering over cannabis”. When smoked, the short-term effects of cannabis manifest within seconds and are fully apparent within a few minutes, typically lasting for 1–3 hours, varying by the person and the strain of cannabis. After oral ingestion of cannabis, the onset of effect is delayed relative to smoking, taking 30 minutes to 2 hours, but the duration is prolonged due to continued slow absorption. The duration of noticeable effects has been observed to diminish after prolonged, repeated use and the development of increased tolerance to cannabinoids. A Hindu man smoking cannabis in Kolkata, India. The psychoactive effects of cannabis, known as a “high“, are subjective and vary among persons and the method of use. When THC enters the blood stream and reaches the brain, it binds to cannabinoid receptors. The endogenous ligand of these receptors is anandamide, the effects of which THC emulates. This agonism of the cannabinoid receptors results in changes in the levels of various neurotransmitters, especially dopamine and norepinephrine; neurotransmitters which are closely associated with the acute effects of cannabis ingestion, such as euphoria and anxiety. Some effects may include a general alteration of conscious perception, euphoria, feelings of well-being, relaxation or stress reduction, increased appreciation of the arts, including humor and music (especially discerning its various components/instruments), joviality, metacognition and introspection, enhanced recollection (episodic memory), increased sensuality, increased awareness of sensation, increased libido, and creativity. Abstract or philosophical thinking, disruption of linear memory and paranoia or anxiety are also typical. Anxiety is the most commonly reported side effect of smoking marijuana. Between 20 and 30 percent of recreational users experience intense anxiety and/or panic attacks after smoking cannabis, however, some report anxiety only after not smoking cannabis for a prolonged period of time. Inexperience and use in an unfamiliar environment are major contributing factors to this anxiety. Cannabidiol (CBD), another cannabinoid found in cannabis in varying amounts, has been shown to ameliorate the adverse effects of THC, including anxiety, that some consumers experience. Cannabis produces many other subjective effects, including an increased enjoyment of food taste and aroma, and marked distortions in the perception of time (where experiencing a “rush” of ideas can create the subjective impression of much time passing). At higher doses, effects can include altered body image, auditory and/or visual illusions, pseudohallucinations, and ataxia from selective impairment of polysynaptic reflexes. In some cases, cannabis can lead to acute psychosis and dissociative states such as depersonalization and derealization. Any episode of acute psychosis that accompanies cannabis use usually abates after 6 hours, but in rare instances, heavy users may find the symptoms continuing for many days. If the episode is accompanied by aggression or sedation, physical restraint may be necessary. While psychoactive drugs are typically categorized as stimulant, depressant, or hallucinogen, cannabis exhibits a mix of all of them, perhaps leaning more towards hallucinogenic or psychedelic properties, though with other effects quite pronounced. THC is considered the primary active component of the cannabis plant. Scientific studies have suggested that other cannabinoids like CBD may also play a significant role in its psychoactive effects. Some of the short-term physical effects of cannabis use include increased heart rate, dry mouth, reddening of the eyes (congestion of the conjunctival blood vessels), a reduction in intra-ocular pressure, muscle relaxation and a sensation of cold or hot hands and feet and / or flushed face. Electroencephalography or EEG shows somewhat more persistent alpha waves of slightly lower frequency than usual. Cannabinoids produce a “marked depression of motor activity” via activation of neuronal cannabinoid receptors belonging to the CB1 subtype. Peak levels of cannabis-associated intoxication occur approximately 30 minutes after smoking it and last for several hours. The total short-term duration of cannabis use when smoked depends on the potency, method of smoking – e.g. whether pure or in conjunction with tobacco – and how much is smoked. Peak levels of intoxication typically last an average of three to four hours. When taken orally (in the form of capsules, food or drink), the psychoactive effects take longer to manifest and generally last longer, typically lasting for an average of four to ten hours after consumption. [unreliable medical source?] Very high doses may last even longer. Also, oral ingestion use eliminates the need to inhale toxic combustion products created by smoking and therefore negates the risk of respiratory harm associated with cannabis smoking. The areas of the brain where cannabinoid receptors are most prevalent are consistent with the behavioral effects produced by cannabinoids. Brain regions in which cannabinoid receptors are very abundant are the basal ganglia, associated with movement control; the cerebellum, associated with body movement coordination; the hippocampus, associated with learning, memory, and stress control; the cerebral cortex, associated with higher cognitive functions; and the nucleus accumbens, regarded as the reward center of the brain. Other regions where cannabinoid receptors are moderately concentrated are the hypothalamus, which regulates homeostatic functions; the amygdala, associated with emotional responses and fears; the spinal cord, associated with peripheral sensations like pain; the brain stem, associated with sleep, arousal, and motor control; and the nucleus of the solitary tract, associated with visceral sensations like nausea and vomiting. Experiments on animal and human tissue have demonstrated a disruption of short-term memory formation, which is consistent with the abundance of C receptors on the hippocampus, the region of the brain most closely associated with memory. Cannabinoids inhibit the release of several neurotransmitters in the hippocampus such as acetylcholine, norepinephrine, and glutamate, resulting in a decrease in neuronal activity in that area. In in-vitro experiments THC at extremely high concentrations, which could not be reached with commonly consumed doses, caused competitive inhibition of the AChE enzyme and inhibition of β-amyloid peptide aggregation, implicated in the development of Alzheimer’s disease. Compared to currently approved drugs prescribed for the treatment of Alzheimer’s disease, THC is a considerably superior inhibitor of A aggregation, and this study provides a previously unrecognized molecular mechanism through which cannabinoid molecules may impact the progression of this debilitating disease. While several studies have shown increased risk associated with cannabis use by drivers, other studies have not found increased risk. Cannabis usage has been shown in some studies to have a negative effect on driving ability. The British Medical Journal indicated that “drivers who consume cannabis within three hours of driving are nearly twice as likely to cause a vehicle collision as those who are not under the influence of drugs or alcohol”. A 2012 meta-analysis found that acute cannabis use increased the risk of an automobile crash. An extensive 2013 review of 66 studies regarding crash risk and drug use found that cannabis was associated with minor, but not statistically significant increased odds of injury or fatal accident. In the largest and most precisely controlled study of its kind carried out by the U.S. Department of Transportation’s National Highway Traffic Safety Administration, it was found that other “studies that measure the presence of THC in the drivers’ blood or oral fluid, rather than relying on self-report tend to have much lower (or no) elevated crash risk estimates. Likewise better controlled studies have found lower (or no) elevated crash risk estimates”. The study found that “after adjusting for age, gender, race and alcohol use, drivers who tested positive for marijuana were no more likely to crash than those who had not used any drugs or alcohol prior to driving”. Short-term (one to two hours) effects on the cardiovascular system can include increased heart rate, dilation of blood vessels, and fluctuations in blood pressure. There are medical reports of occasional heart attacks or myocardial infarction, stroke and other cardiovascular side effects. Marijuana’s cardiovascular effects are not associated with serious health problems for most young, healthy users. Researchers reported in the International Journal of Cardiology, “Marijuana use by older people, particularly those with some degree of coronary artery or cerebrovascular disease, poses greater risks due to the resulting increase in catecholamines, cardiac workload, and carboxyhemoglobin levels, and concurrent episodes of profound postural hypotension. Indeed, marijuana may be a much more common cause of myocardial infarction than is generally recognized. In day-to-day practice, a history of marijuana use is often not sought by many practitioners, and even when sought, the patient’s response is not always truthful”. A 2013 analysis of 3,886 myocardial infarction survivors over an 18-year period showed “no statistically significant association between marijuana use and mortality”. A 2008 study by the National Institutes of Health Biomedical Research Centre in Baltimore found that heavy, chronic smoking of marijuana (138 joints per week) changed blood proteins associated with heart disease and stroke. A 2000 study by researchers at Boston’s Beth Israel Deaconess Medical Center, Massachusetts General Hospital and Harvard School of Public Health found that a middle-age person’s risk of heart attack rises nearly fivefold in the first hour after smoking marijuana, “roughly the same risk seen within an hour of sexual activity”. Cannabis arteritis is a very rare peripheral vascular disease similar to Buerger’s disease. There were about 50 confirmed cases from 1960 to 2008, all of which occurred in Europe. A confounding factor in cannabis research is the prevalent usage of other recreational drugs, especially alcohol and nicotine. Such complications demonstrate the need for studies on cannabis that have stronger controls, and investigations into alleged symptoms of cannabis use that may also be caused by tobacco. Some critics question whether agencies doing the research make an honest effort to present an accurate, unbiased summary of the evidence, or whether they “cherry-pick” their data to please funding sources which may include the tobacco industry or governments dependent on cigarette tax revenue; others caution that the raw data, and not the final conclusions, are what should be examined. The Australian National Household Survey of 2001 showed that cannabis in Australia is rarely used without other drugs. 95% of cannabis users also drank alcohol; 26% took amphetamines; 19% took ecstasy and only 2.7% reported not having used any other drug with cannabis. While research has been undertaken on the combined effects of alcohol and cannabis on performing certain tasks, little research has been conducted on the reasons why this combination is so popular. Evidence from a controlled experimental study undertaken by Lukas and Orozco suggests that alcohol causes THC to be absorbed more rapidly into the blood plasma of the user. Data from the Australian National Survey of Mental Health and Wellbeing found that three-quarters of recent cannabis users reported using alcohol when cannabis was not available, this suggests that the two are substitutes. Studies on cannabis and memory are hindered by small sample sizes, confounding drug use, and other factors. The strongest evidence regarding cannabis and memory focuses on its temporary negative effects on short-term and working memory. In a 2001 study looking at neuropsychological performance in long-term cannabis users, researchers found “some cognitive deficits appear detectable at least 7 days after heavy cannabis use but appear reversible and related to recent cannabis exposure rather than irreversible and related to cumulative lifetime use”. On his studies regarding cannabis use, lead researcher and Harvard professor Harrison Pope said he found marijuana is not dangerous over the long term, but there are short-term effects. From neuropsychological tests, Pope found that chronic cannabis users showed difficulties, with verbal memory in particular, for “at least a week or two” after they stopped smoking. Within 28 days, memory problems vanished and the subjects “were no longer distinguishable from the comparison group”. Researchers from the University of California, San Diego School of Medicine failed to show substantial, systemic neurological effects from long-term recreational use of cannabis. Their findings were published in the July 2003 issue of the Journal of the International Neuropsychological Society. The research team, headed by Dr Igor Grant, found that cannabis use did affect perception, but did not cause permanent brain damage. Researchers looked at data from 15 previously published controlled studies involving 704 long-term cannabis users and 484 nonusers. The results showed long-term cannabis use was only marginally harmful on the memory and learning. Other functions such as reaction time, attention, language, reasoning ability, perceptual and motor skills were unaffected. The observed effects on memory and learning, they said, showed long-term cannabis use caused “selective memory defects”, but that the impact was “of a very small magnitude”. A study at Johns Hopkins University School of Medicine showed that very heavy use of marijuana is associated with decrements in neurocognitive performance even after 28 days of abstinence. The feeling of increased appetite following the use of cannabis has been documented for hundreds of years, and is known colloquially as “the munchies” in the English-speaking world. Clinical studies and survey data have found that cannabis increases food enjoyment and interest in food. A 2015 study suggests that cannabis triggers uncharacteristic behaviour in POMC neurons, which are usually associated with decreasing hunger. Rarely, chronic users experience a severe vomiting disorder, cannabinoid hyperemesis syndrome, after smoking and find relief by taking hot baths. Endogenous cannabinoids (“endocannabinoids”) were discovered in cow’s milk and soft cheeses. Endocannabinoids are also found in human breast milk. It is widely accepted that the neonatal survival of many species “is largely dependent upon their suckling behavior, or appetite for breast milk” and recent research has identified the endogenous cannabinoid system to be the first neural system to display complete control over milk ingestion and neonatal survival. It is possible that “cannabinoid receptors in our body interact with the cannabinoids in milk to stimulate a suckling response in newborns so as to prevent growth failure”. Most microorganisms found in cannabis only affect plants and not humans, but some microorganisms, especially those that proliferate when the herb is not correctly dried and stored, can be harmful to humans. Some users may store marijuana in an airtight bag or jar in a refrigerator to prevent fungal and bacterial growth. The fungi Aspergillus flavus, Aspergillus fumigatus, Aspergillus niger, Aspergillus parasiticus, Aspergillus tamarii, Aspergillus sulphureus, Aspergillus repens, Mucor hiemalis (not a human pathogen), Penicillium chrysogenum, Penicillium italicum and Rhizopus nigrans have been found in moldy cannabis. Aspergillus mold species can infect the lungs via smoking or handling of infected cannabis and cause opportunistic and sometimes deadly aspergillosis. Some of the microorganisms found create aflatoxins, which are toxic and carcinogenic. Researchers suggest that moldy cannabis should thus be discarded to avoid these serious risks. Cannabis contaminated with Salmonella muenchen was positively correlated with dozens of cases of salmonellosis in 1981. “Thermophilic actinomycetes” were also found in cannabis. Exposure to marijuana may have biologically-based physical, mental, behavioral and social health consequences and is “associated with diseases of the liver (particularly with co-existing hepatitis C), lungs, heart, eyesight and vasculature” according to a 2013 literature review by Gordon and colleagues. The association with these diseases has only been reported in cases where people have smoked cannabis. The authors cautioned that “evidence is needed, and further research should be considered, to prove causal associations of marijuana with many physical health conditions”. Cannabis use disorder is defined in the fifth revision of the Diagnostic and Statistical Manual of Mental Disorders (DSM-5) as a condition requiring treatment. Several drugs have been investigated in an attempt to ameliorate the symptoms of stopping cannabis use. Such drugs include bupropion, divalproex, nefazodone, lofexidine, and dronabinol. Of these, dronabinol has proven the most effective. Cannabis consumption in pregnancy might be associated with restrictions in growth of the fetus, miscarriage, and cognitive deficits in offspring based on animal studies, although there is limited evidence for this in humans at this time. A 2012 systematic review found although it was difficult to draw firm conclusions, there was some evidence that prenatal exposure to cannabis was associated with “deficits in language, attention, areas of cognitive performance, and delinquent behavior in adolescence”. A report prepared for the Australian National Council on Drugs concluded cannabis and other cannabinoids are contraindicated in pregnancy as it may interact with the endocannabinoid system. ^ Rudolf Brenneisen. “Chemistry and Analysis of Phytocannabinoids and Other Cannabis Constituents” (PDF). Medicinalgenomics.com. Retrieved 9 April 2018. ^ Atakan Z (December 2012). “Cannabis, a complex plant: different compounds and different effects on individuals”. Therapeutic Advances in Psychopharmacology. 2 (6): 241–54. doi:10.1177/2045125312457586. PMC 3736954. PMID 23983983. ^ Osborne GB, Fogel C (2008). “Understanding the motivations for recreational marijuana use among adult Canadians”. Substance Use & Misuse. 43 (3–4): 539–72, discussion 573–9, 585–7. doi:10.1080/10826080701884911. PMID 18365950. ^ Ranganathan M, D’Souza DC (November 2006). “The acute effects of cannabinoids on memory in humans: a review”. Psychopharmacology. 188 (4): 425–44. doi:10.1007/s00213-006-0508-y. PMID 17019571. ^ Grotenhermen F (2003). “Pharmacokinetics and pharmacodynamics of cannabinoids”. Clinical Pharmacokinetics. 42 (4): 327–60. doi:10.2165/00003088-200342040-00003. PMID 12648025. ^ White, CM (7 February 2019). “A Review of Human Studies Assessing Cannabidiol’s (CBD) Therapeutic Actions and Potential”. Journal of clinical pharmacology. doi:10.1002/jcph.1387. PMID 30730563. ^ Haney, M; Malcolm, RJ; Babalonis, S; Nuzzo, PA; Cooper, ZD; Bedi, G; Gray, KM; McRae-Clark, A; Lofwall, MR; Sparenborg, S; Walsh, SL (July 2016). “Oral Cannabidiol does not Alter the Subjective, Reinforcing or Cardiovascular Effects of Smoked Cannabis”. Neuropsychopharmacology : official publication of the American College of Neuropsychopharmacology. 41 (8): 1974–82. doi:10.1038/npp.2015.367. PMID 26708108. ^ Tomar, Rajpal C.; Beaumont and Hsieh (August 2009). “Evidence on the carcinogenicity of marijuana smoke” (PDF). Reproductive and Cancer Hazard Assessment Branch Office of Environmental Health Hazard Assessment, California Environmental Protection Agency. Retrieved 29 November 2018. ^ Leweke FM, Koethe D (June 2008). “Cannabis and psychiatric disorders: it is not only addiction”. Addiction Biology. 13 (2): 264–75. doi:10.1111/j.1369-1600.2008.00106.x. PMID 18482435. ^ Rubino T, Parolaro D (April 2008). “Long lasting consequences of cannabis exposure in adolescence”. Molecular and Cellular Endocrinology (Submitted manuscript). 286 (1–2 Suppl 1): S108–13. doi:10.1016/j.mce.2008.02.003. PMID 18358595. ^ Michael Slezak (2009-09-01). “Doubt cast on cannabis, schizophrenia link”. Abc.net.au. Retrieved 2013-01-08. ^ “Boston Municipal Courtcentral Division. Docket # 0701CR7229” (PDF). 2008. Retrieved 2013-01-08. ^ DeLisi LE (March 2008). “The effect of cannabis on the brain: can it cause brain anomalies that lead to increased risk for schizophrenia?”. Current Opinion in Psychiatry. 21 (2): 140–50. doi:10.1097/YCO.0b013e3282f51266. PMC 4337025. PMID 18332661. ^ Denson TF, Earleywine M (April 2006). “Decreased depression in marijuana users”. Addictive Behaviors. 31 (4): 738–42. doi:10.1016/j.addbeh.2005.05.052. PMID 15964704. ^ Grohol, John M.. (2013-05-21) Psy.D:DSM-5 Changes: Addiction, Substance-Related Disorders & Alcoholism. Pro.psychcentral.com. Retrieved on 2016-12-19. ^ Escondido N (2017-04-26). “The Strongest Strains on Earth 2017”. High Times. Retrieved 30 June 2018. ^ Turner CE, Bouwsma OJ, Billets S, Elsohly MA (June 1980). “Constituents of Cannabis sativa L. XVIII–Electron voltage selected ion monitoring study of cannabinoids”. Biomedical Mass Spectrometry. 7 (6): 247–56. doi:10.1002/bms.1200070605. PMID 7426688. ^ H.K. Kalant; W.H.E. Roschlau (1998). Principles of Medical Pharmacology (6th ed.). pp. 373–375. ^ Hampson AJ, Grimaldi M, Axelrod J, Wink D (July 1998). “Cannabidiol and (-)Delta9-tetrahydrocannabinol are neuroprotective antioxidants”. Proceedings of the National Academy of Sciences of the United States of America. 95 (14): 8268–73. Bibcode:1998PNAS…95.8268H. doi:10.1073/pnas.95.14.8268. PMC 20965. PMID 9653176. ^ Pertwee RG (January 1997). “Pharmacology of cannabinoid CB1 and CB2 receptors”. Pharmacology & Therapeutics. 74 (2): 129–80. doi:10.1016/S0163-7258(97)82001-3. PMID 9336020. ^ H. Abadinsky (2004). Drugs: An Introduction (5th ed.). pp. 62–77, 160–166. ISBN 978-0-534-52750-1. ^ “How long does cannabis stay in the body after smoking?”. NHS. Retrieved 4 August 2015. ^ Calabria B, Degenhardt L, Hall W, Lynskey M (May 2010). “Does cannabis use increase the risk of death? Systematic review of epidemiological evidence on adverse effects of cannabis use”. Drug and Alcohol Review (Review). 29 (3): 318–30. doi:10.1111/j.1465-3362.2009.00149.x. PMID 20565525. ^ Ashton CH (February 2001). “Pharmacology and effects of cannabis: a brief review”. The British Journal of Psychiatry (Review). 178 (2): 101–6. doi:10.1192/bjp.178.2.101. PMID 11157422. ^ Fitzgerald KT, Bronstein AC, Newquist KL (February 2013). “Marijuana poisoning”. Topics in Companion Animal Medicine. 28 (1): 8–12. doi:10.1053/j.tcam.2013.03.004. PMID 23796481. ^ a b c Moir D, Rickert WS, Levasseur G, Larose Y, Maertens R, White P, Desjardins S (February 2008). “A comparison of mainstream and sidestream marijuana and tobacco cigarette smoke produced under two machine smoking conditions”. Chemical Research in Toxicology. 21 (2): 494–502. doi:10.1021/tx700275p. PMID 18062674. ^ Institute of Medicine (1982). Marijuana and Health. Washington, D.C.: The National Academies Press. doi:10.17226/18942. ISBN 978-0-309-03236-0. ^ Malmo-Levine, David (2002-01-02). “Radioactive Tobacco”. acsa2000.net. Archived from the original on 2013-01-12. ^ “Does smoking cannabis cause cancer?”. Cancer Research UK. 20 September 2010. Archived from the original on 29 July 2012. Retrieved 23 June 2012. ^ Tashkin D (March 1997). “Effects of marijuana on the lung and its immune defenses”. UCLA School of Medicine. Retrieved 2012-06-23. ^ “Chemicals known to the state to cause cancer or reproductive toxicity” (PDF). ca.gov. 2012-07-20. Archived from the original (PDF) on 2013-01-20. Retrieved 2013-01-08. ^ “The impact of cannabis on your lung”. British Lung Association. June 2012. Archived from the original on 2013-09-27. Retrieved 2013-01-08. ^ Le B (2012-06-08). “Drug prof slams pot lung-danger claims”. The Fix. Retrieved 2013-01-09. ^ a b Ashton CH (February 2001). “Pharmacology and effects of cannabis: a brief review”. The British Journal of Psychiatry. 178 (2): 101–6. doi:10.1192/bjp.178.2.101. PMID 11157422. ^ “Cannabis”. Dasc.sa.gov.au. Archived from the original on 2011-03-27. Retrieved 2011-04-20. ^ “Medical Marijuana and the Mind”. Harvard Mental Health Letter. April 2010. Retrieved April 25, 2011. ^ Niesink RJ, van Laar MW (October 2013). “Does Cannabidiol Protect Against Adverse Psychological Effects of THC?”. Frontiers in Psychiatry (Review). 4: 130. doi:10.3389/fpsyt.2013.00130. PMC 3797438. PMID 24137134. ^ “Medication-Associated Depersonalization Symptoms”. Medscape. ^ Shufman E, Lerner A, Witztum E (April 2005). “[Depersonalization after withdrawal from cannabis usage]” (PDF). Harefuah (in Hebrew). 144 (4): 249–51, 303. PMID 15889607. Archived from the original (PDF) on March 1, 2011. ^ Johnson BA (February 1990). “Psychopharmacological effects of cannabis”. British Journal of Hospital Medicine. 43 (2): 114–6, 118–20, 122. PMID 2178712. ^ a b Barceloux DG (20 March 2012). “Chapter 60: Marijuana (Cannabis sativa L.) and synthetic cannabinoids”. Medical Toxicology of Drug Abuse: Synthesized Chemicals and Psychoactive Plants. John Wiley & Sons. p. 915. ISBN 978-0-471-72760-6. ^ Stafford, Peter (1992). Psychedelics Encyclopedia. Berkeley, California, United States: Ronin Publishing, Inc. ISBN 978-0-914171-51-5. ^ McKim, William A (2002). Drugs and Behavior: An Introduction to Behavioral Pharmacology (5 ed.). Prentice Hall. p. 400. ISBN 978-0-13-048118-4. ^ “Information on Drugs of Abuse”. Commonly Abused Drug Chart. nih.gov. 2018-07-02. ^ Moelker W (19 Sep 2008). “How does Marijuana Affect Your Body? What are the Marijuana Physical Effects?”. ^ Kalant, H.K. ; Roschlau, W.H.E. (1998). Principles of Medical Pharmacology (6th ed.). pp. 373–375. ^ Andersson M, Usiello A, Borgkvist A, Pozzi L, Dominguez C, Fienberg AA, Svenningsson P, Fredholm BB, Borrelli E, Greengard P, Fisone G (September 2005). “Cannabinoid action depends on phosphorylation of dopamine- and cAMP-regulated phosphoprotein of 32 kDa at the protein kinase A site in striatal projection neurons”. The Journal of Neuroscience. 25 (37): 8432–8. doi:10.1523/JNEUROSCI.1289-05.2005. PMID 16162925. ^ a b Crean RD, Crane NA, Mason BJ (March 2011). “An evidence based review of acute and long-term effects of cannabis use on executive cognitive functions”. Journal of Addiction Medicine. 5 (1): 1–8. doi:10.1097/ADM.0b013e31820c23fa. PMC 3037578. PMID 21321675. ^ “Erowid Cannabis (Marijuana) Vault : Effects”. Erowid.org. Retrieved 9 April 2018. ^ Pertwee RG (1997). “Pharmacology of cannabinoid CB1 and CB2 receptors”. Pharmacology & Therapeutics. 74 (2): 129–80. doi:10.1016/S0163-7258(97)82001-3. PMID 9336020. ^ Eubanks LM, Rogers CJ, Beuscher AE, Koob GF, Olson AJ, Dickerson TJ, Janda KD (2006). “A molecular link between the active component of marijuana and Alzheimer’s disease pathology”. Molecular Pharmaceutics. 3 (6): 773–7. doi:10.1021/mp060066m. PMC 2562334. PMID 17140265. ^ a b Compton R, Berning A (February 2015). “Drug and Alcohol Crash Risk” (PDF). Traffic Safety Facts. ^ Li MC, Brady JE, DiMaggio CJ, Lusardi AR, Tzong KY, Li G (2012). “Marijuana use and motor vehicle crashes”. Epidemiologic Reviews. 34 (1): 65–72. doi:10.1093/epirev/mxr017. PMC 3276316. PMID 21976636. ^ Asbridge M, Hayden JA, Cartwright JL (February 2012). “Acute cannabis consumption and motor vehicle collision risk: systematic review of observational studies and meta-analysis”. BMJ. 344: e536. doi:10.1136/bmj.e536. PMC 3277079. PMID 22323502. ^ Department For Transport, Great Minster House. “Cannabis and driving: a review of the literature and commentary (No.12)”. Department of Transport. UK Government. Retrieved 19 December 2016. ^ Asbridge M, Hayden JA, Cartwright JL (February 2012). “Acute cannabis consumption and motor vehicle collision risk: systematic review of observational studies and meta-analysis”. BMJ. 344 (feb09 2): e536. doi:10.1136/bmj.e536. PMC 3277079. PMID 22323502. ^ Elvik R (November 2013). “Risk of road accident associated with the use of drugs: a systematic review and meta-analysis of evidence from epidemiological studies”. Accident Analysis and Prevention. 60: 254–67. doi:10.1016/j.aap.2012.06.017. PMID 22785089. ^ Ingraham, C (9 February 2015). “Stoned drivers are a lot safer than drunk ones, new federal data show”. Washington Post. Retrieved 13 February 2015. ^ Lee J, Abdel-Aty A, Park J (May 2018). “Investigation of associations between marijuana law changes and marijuana-involved fatal traffic crashes: A state-level analysis”. Journal of Transport & Health. 10: 194–202. doi:10.1016/j.jth.2018.05.017. ^ Falvo, D R (2005). Medical and psychosocial aspects of chronic illness and disability (Third ed.). Jones & Bartlett Learning. p. 217. ISBN 978-0-7637-3166-3. ^ Ghodse, Hamid (2010). Ghodse’s Drugs and Addictive Behaviour. Cambridge University Press. p. 97. ISBN 978-1-139-48567-8. ^ Jones RT (November 2002). “Cardiovascular system effects of marijuana”. Journal of Clinical Pharmacology. 42 (S1): 58S–63S. Bibcode:1991JClP…31..928S. doi:10.1002/j.1552-4604.2002.tb06004.x. PMID 12412837. ^ a b Jones RT (November 2002). “Cardiovascular system effects of marijuana”. Journal of Clinical Pharmacology. 42 (S1): 58S–63S. Bibcode:1991JClP…31..928S. doi:10.1002/j.1552-4604.2002.tb06004.x. PMID 12412837. ^ Aryana A, Williams MA (May 2007). “Marijuana as a trigger of cardiovascular events: speculation or scientific certainty?”. International Journal of Cardiology. 118 (2): 141–4. doi:10.1016/j.ijcard.2006.08.001. PMID 17005273. ^ Frost L, Mostofsky E, Rosenbloom JI, Mukamal KJ, Mittleman MA (February 2013). “Marijuana use and long-term mortality among survivors of acute myocardial infarction”. American Heart Journal. 165 (2): 170–5. doi:10.1016/j.ahj.2012.11.007. PMC 3558923. PMID 23351819. 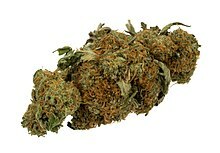 ^ “Heavy pot smoking could raise risk of heart attack, stroke”. CBC. 2008-05-13. Retrieved 2009-04-17. ^ “Marijuana Linked to Increased Stroke Risk – TIME.com”. Time. 2013-02-08. ^ Noble HB (2000-03-03). “Report Links Heart Attacks To Marijuana”. New York Times. Retrieved 2009-04-26. ^ Peyrot I, Garsaud AM, Saint-Cyr I, Quitman O, Sanchez B, Quist D (March 2007). “Cannabis arteritis: a new case report and a review of literature”. Journal of the European Academy of Dermatology and Venereology. 21 (3): 388–91. doi:10.1111/j.1468-3083.2006.01947.x. PMID 17309465. Amputation of the right second toe and of the left leg finally became necessary. ^ Zhang ZF, Morgenstern H, Spitz MR, Tashkin DP, Yu GP, Marshall JR, Hsu TC, Schantz SP (December 1999). “Marijuana use and increased risk of squamous cell carcinoma of the head and neck”. Cancer Epidemiology, Biomarkers & Prevention. 8 (12): 1071–8. PMID 10613339. ^ “Public opinion on drugs and drug policy”. Fact Research Guide. Easton Business Centre, Felix Rd., Bristol, UK. : Transform Drug Policy Foundation. Archived from the original on 15 July 2014. Retrieved 24 March 2007. Data is notoriously easy to cherry pick or spin to support a particular agenda or position. Often the raw data will conceal all sorts of interesting facts that the headlines have missed. ^ “2001 National Drug Strategy Household Survey: detailed findings”. Australian Institute of Health and Welfare. 2002-12-19. Archived from the original on 2011-02-21. Retrieved 2011-02-01. AIHW cat no. PHE 41. ^ “2001 National Drug Steategy Household Survey: first results”. Australian Institute of Health and Welfare. 2002-05-20. Archived from the original on 2011-02-21. Retrieved 2011-02-01. AIHW cat no. PHE 35. ^ Lukas SE, Orozco S (October 2001). “Ethanol increases plasma Delta(9)-tetrahydrocannabinol (THC) levels and subjective effects after marihuana smoking in human volunteers”. Drug and Alcohol Dependence. 64 (2): 143–9. doi:10.1016/S0376-8716(01)00118-1. PMID 11543984. ^ Kee, Carol (August 1998). National Survey of Mental Health and Wellbeing of Adults 1997. ACT Department of Health and Community Care. ^ Degenhardt L, Hall W (August 2001). “The relationship between tobacco use, substance-use disorders and mental health: results from the National Survey of Mental Health and Well-being”. Nicotine & Tobacco Research. 3 (3): 225–34. doi:10.1080/14622200110050457. PMID 11506766. ^ a b Riedel G, Davies SN (2005). Cannabinoid function in learning, memory and plasticity. Handbook of Experimental Pharmacology. 168. pp. 445–77. doi:10.1007/3-540-26573-2_15. ISBN 978-3-540-22565-2. PMID 16596784. ^ Pope HG, Gruber AJ, Hudson JI, Huestis MA, Yurgelun-Todd D (October 2001). “Neuropsychological performance in long-term cannabis users”. Archives of General Psychiatry. 58 (10): 909–15. doi:10.1001/archpsyc.58.10.909. PMID 11576028. ^ Lyons, Casey (October 2012) Lost in the Weeds: Legalizing Medical Marijuana in Massachusetts. Boston Magazine. ^ Bolla KI, Brown K, Eldreth D, Tate K, Cadet JL (November 2002). “Dose-related neurocognitive effects of marijuana use”. Neurology. 59 (9): 1337–43. doi:10.1212/01.WNL.0000031422.66442.49. PMID 12427880. ^ Ad Hoc Group of Experts. “Workshop on the Medical Utility of Marijuana”. Report to the Director, Institute of Medicine. U.S. National Institutes of Health. Archived from the original on 3 November 2007. ^ Devlin H (2015-02-18). “Cannabis ‘munchies’ explained by new research”. The Guardian. Retrieved 2018-10-18. ^ Koch M, Varela L, Kim JG, Kim JD, Hernández-Nuño F, Simonds SE, Castorena CM, Vianna CR, Elmquist JK, Morozov YM, Rakic P, Bechmann I, Cowley MA, Szigeti-Buck K, Dietrich MO, Gao XB, Diano S, Horvath TL (March 2015). “Hypothalamic POMC neurons promote cannabinoid-induced feeding”. Nature. 519 (7541): 45–50. Bibcode:2015Natur.519…45K. doi:10.1038/nature14260. PMC 4496586. PMID 25707796. ^ Sontineni SP, Chaudhary S, Sontineni V, Lanspa SJ (March 2009). “Cannabinoid hyperemesis syndrome: clinical diagnosis of an underrecognised manifestation of chronic cannabis abuse”. World Journal of Gastroenterology. 15 (10): 1264–6. doi:10.3748/wjg.15.1264. PMC 2658859. PMID 19291829. ^ di Tomaso E, Beltramo M, Piomelli D (August 1996). “Brain cannabinoids in chocolate”. Nature (Submitted manuscript). 382 (6593): 677–8. Bibcode:1996Natur.382..677D. doi:10.1038/382677a0. PMID 8751435. ^ Fride E, Bregman T, Kirkham TC (April 2005). “Endocannabinoids and food intake: newborn suckling and appetite regulation in adulthood” (PDF). Experimental Biology and Medicine. 230 (4): 225–34. doi:10.1177/153537020523000401. PMID 15792943. ^ Wu J, Gouveia-Figueira S, Domellöf M, Zivkovic AM, Nording ML (January 2016). “Oxylipins, endocannabinoids, and related compounds in human milk: Levels and effects of storage conditions”. Prostaglandins & Other Lipid Mediators. 122: 28–36. doi:10.1016/j.prostaglandins.2015.11.002. PMID 26656029. ^ a b Fride E (October 2004). “The endocannabinoid-CB(1) receptor system in pre- and postnatal life”. European Journal of Pharmacology. 500 (1–3): 289–97. doi:10.1016/j.ejphar.2004.07.033. PMID 15464041. ^ a b “NCPIC Research Briefs • NCPIC”. Ncpic.org.au. 2011-03-11. Archived from the original on 2011-07-06. Retrieved 2011-04-20. “Microbiological contaminants of marijuana”. www.hempfood.com. Retrieved 2008-06-22. ^ a b c d e Kagen SL, Kurup VP, Sohnle PG, Fink JN (April 1983). “Marijuana smoking and fungal sensitization”. The Journal of Allergy and Clinical Immunology. 71 (4): 389–93. doi:10.1016/0091-6749(83)90067-2. PMID 6833678. ^ Remington TL, Fuller J, Chiu I (November 2015). “Chronic necrotizing pulmonary aspergillosis in a patient with diabetes and marijuana use”. CMAJ. 187 (17): 1305–8. doi:10.1503/cmaj.141412. PMC 4646751. PMID 26100839. ^ Taylor DN, Wachsmuth IK, Shangkuan YH, Schmidt EV, Barrett TJ, Schrader JS, Scherach CS, McGee HB, Feldman RA, Brenner DJ (May 1982). “Salmonellosis associated with marijuana: a multistate outbreak traced by plasmid fingerprinting”. The New England Journal of Medicine. 306 (21): 1249–53. doi:10.1056/NEJM198205273062101. PMID 7070444. ^ a b Gordon AJ, Conley JW, Gordon JM (December 2013). “Medical consequences of marijuana use: a review of current literature”. Current Psychiatry Reports (Submitted manuscript). 15 (12): 419. doi:10.1007/s11920-013-0419-7. PMID 24234874. ^ Vandrey R, Haney M (2009). “Pharmacotherapy for cannabis dependence: how close are we?”. CNS Drugs (Review). 23 (7): 543–53. doi:10.2165/00023210-200923070-00001. PMC 2729499. PMID 19552483. ^ Fonseca BM, Correia-da-Silva G, Almada M, Costa MA, Teixeira NA (2013). “The Endocannabinoid System in the Postimplantation Period: A Role during Decidualization and Placentation”. International Journal of Endocrinology (Review). 2013: 1–11. doi:10.1155/2013/510540. PMC 3818851. PMID 24228028. ^ Irner TB (2012). “Substance exposure in utero and developmental consequences in adolescence: a systematic review”. Child Neuropsychology (Review). 18 (6): 521–49. doi:10.1080/09297049.2011.628309. PMID 22114955. ^ Copeland J, Gerber S, Swift W (2006). Evidence-based answers to cannabis questions: a review of the literature. Canberra: Australian National Council on Drugs. ISBN 978-1-877018-12-1. Ramström, J. (2003), Adverse Health Consequences of Cannabis Use, A Survey of Scientific Studies Published up to and including the Autumn of 2003, National institute of public health, Sweden, Stockholm. Hall, W., Solowij, N., Lemon, J., The Health and Psychological Consequences of Cannabis Use. Canberra: Australian Government Publishing Service; 1994. World Health Organisation, PROGRAMME ON SUBSTANCE ABUSE, Cannabis: a health perspective and research agenda;1997.